Value, like beauty is in the eye of the beholder. 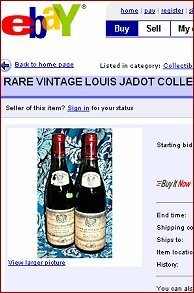 That said, I expect the market for vintage Beaujolais is rather limited – just one guy/gal in Ohio it seems – at least when he/she wants $1,200 for said bottles. They say that there’s one born every minute (mug that is), I expect our person in Ohio will have to trawl very wide to find them!